Recording artist Karen Wolfe is no newcomer to the world of Southern Soul & Blues. However, “Karen Wolfe” recorded her first album with a Gospel Quartet group called “The Harmonettes” the CD was titled “Stop By Here”. The group later changed their name to “Direction” and went on to record their sophomore CD that was titled “God Don’t Make Mistakes”. After the group dissolved, “Karen’s” musical career took a change in direction. “Karen” joined the Soul & Blues arena by singing background behind the Queen of the Blues, the Legendary Denise LaSalle. After listening to “Karen” sing, B & J Records Executives, the Late Bill Coday(Get Your Lies Straight) and Anna Neal Chew (at that time Denise LaSalle’s Road Manager)approached “Karen” abo ut signing a record deal with their Label, B & J Records (now Coday Records). In 2006 they released the CD “First Time Out”. The lead off song “Back Door Love Affair”, which was written by her label mate, Mr. James Smith, was hethisrst Soul & Blues hit. In 2009, they released the CD “A Woman Needs A Strong Man” which holds the hit song “Man Enough”. This song has given “Karen” the opportunity to travel and do countless live shows in numerous cities. “Man Enough” has also become a woman’s anthem for real women. In 2011, the release of the single “Stuttering” was the groundwork to the 2012 release of the CD “Telling It Like It Is”. 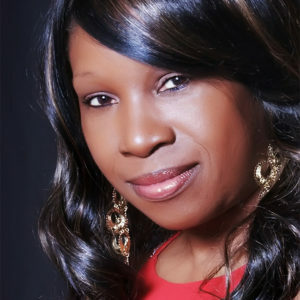 Karen has been on stage with renowned artists such as: “Denise LaSalle”, “Bobby Rush”, “T.K. Soul”, “Floyd Taylor”, “Jeff Floyd”, “Willie Clayton”, “Sheba Potts-Wright”, “Mel Waiters”, “James Smith”, “Terry Wright”, and “Andre’ Lee” to name a few. “Karen” has also shared the stage with some Late Great Legends: “Bill Coday”, “Marvin Sease”, “J. Blackfoot”, “Tyrone Davis”, “Little Milton” and “Johnny Taylor”. Karen Wolfe” came out running hard with the hopes of becoming a household name. And now she is also worldwide and being heard and loved in countries abroad such as: Japan, Switzerland, Italy, Norway, and Spain.